This has been the wettest month of June in recent memory. Is it a coincidence that the word rain is a jumbled version of Iran where civilization has had a nervous breakdown? Is our climate having a breakdown as well? 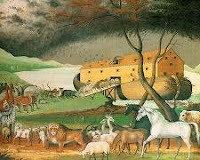 Climatologist's point to global warming as the cause of this rain, and my soggy mind has been occupied with building an ark – the kind Noah had constructed when faced by the great flood – only I’m building it inside my roiling brain. Now comes the big question With whom do we fill it? You, of course, reader, are welcome aboard, but without your flat screen TV, gas guzzler van, exhausted cell-phone and whining children with ipods glued to their ears. Being human I would go for my own family first. Taking care of one’s own comes with the Good Book seal of approval. Noah didn’t leave his family out to surf the rising waves. Both my sons and their significant others, together with my grand-daughters, my good wife, the family Labrador Sam, and cats Byron and Kittay would make it aboard. Statement of Jim Hansen at 23 June 2009 Coal River Mountain rally. 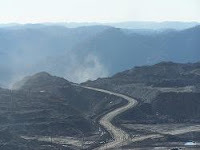 Mountaintop removal ignites strong passions because local effects are obvious – pollution of air and water, effects on human health, destruction of the environment. 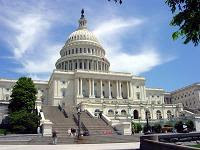 But another effect of coal mining, global climate change, will become important in the next few decades. Climate change will have large consequences for people who are alive today, especially children, and future generations. President Obama speaks of “a planet in peril” for good reason. If we do not move rapidly to carbon-free energy, we will hand our children a planet that has passed climate tipping points. It will be a more desolate planet, with half or more species committed to extinction. Burning all fossil fuels would destroy the future of young people and the unborn. Coal is the critical issue. Coal is the main cause of climate change. It is also the dirtiest fossil fuel. Air pollution, arsenic, and mercury from coal have devastating effects on human health and cause birth defects. The Appalachian region has been supplying American with cheap energy for generations, a duty it has performed with a sense of pride and patriotism. But while electricity from the region’s coal has been cheap for the rest of us, the price has been extraordinarily high for the people of the mountains. That price took on a new dimension this week in a peer-reviewed study from the Health Policy Institute at West Virginia University. Researcher Michael Hendryx reports that coal mining costs the region five times more in early deaths than it provides in economic benefits. Hendryx’s sobering calculation is that the coal industry provides about $8 billion annually in jobs, taxes and other economic benefits -- but premature deaths attributed to coal mining and its impacts, including local air and water pollution, cost the region $42 billion. Hendryx qualifies this estimate, saying it’s impossible to calculate these numbers with absolute certainty. But even a cursory look at how coal is extracted in Appalachia – largely now through the incredibly destructive practice of mountain top removal – leads reasonable people to conclude that Hendryx is on the right track. I’ll write a great deal about the ongoing Appalachian tragedy in the future, but in this post I’ll focus on the ecology of decision-making in Washington D.C. that allows national energy policy to be so destructive, even deadly. The other day I sent an email to the President of Bard College, my Alma Mater, protesting an award sponsored by the college that was restricted to novelists under 39 years old. It wasn't about my feeling excluded from that competition. I'm well over 39 but I am not an older novelist shut out of a chance for some prize money and a job, nor am I a professional protester. But it seemed to me that the college had taken a misstep in its prize-giving. If they had asked me I would not have called it the Bard Fiction Prize but the Jack Benny Prize after that beloved comedian who foolishly and forever gave his age as 39. In hearing about the 12 year sentence of lard labor for nothing more specific than "grave crimes" against North Korea, journalists Laura Ling and Euna Lee are on the minds of many, including the realization that they are indeed pawns of a totalitarian regime bent on "proving" some sort of strength through the subjugation of others. Instead, it proves nothing but cowardice, for only a despotic regime would brutally subjugate others to prove a sense of power or control.